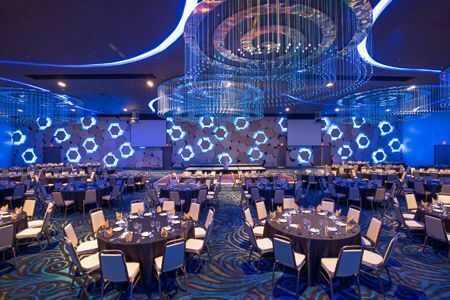 The Guam Convention Centre opened its doors at newly opened Dusit Thani Guam Resort. "We are delighted to introduce Thai graciousness and hospitality to this vibrant destination and provide a new, exciting luxury hotel experience for our guests. We believe we can attract a new type of visitor to Guam and capture some of the M.I.C.E. market in the region with our world-class convention centre facilities," said Dusit Thani Guam Resort General Manager, Mr Dean Huntsman. With over 1,169sqm of flexible event space, the Guam Convention Center pairs ideal event venues with impeccable, gracious hospitality. The Grand Ballroom can accommodate up to 1,000 attendees for a seated dinner and is joined by two Royal Ballrooms, the Salons, the Cellar, Pantry, Living Room and Study, for a total of 10 function spaces that cater to events of any size. The Convention Center is further complemented by the resort's innovative dining portfolio consisting of six restaurants and lounges, including Aqua, an international all day dining restaurant with live cooking stations, Alfredo's Tuscan Steakhouse which features house-cured steaks and handmade pastas, and Soi, presenting a modern twist on Thai street food. Six private villa suites are set to open in the coming weeks offering the discerning traveller an unprecedented stay experience on the island. Each villa suite has its own private plunge pool, personal concierge service and exclusive gym. The 3-bedroom Villa Azul even boasts a 550sqm balcony, perfectly suited for outdoor entertaining.